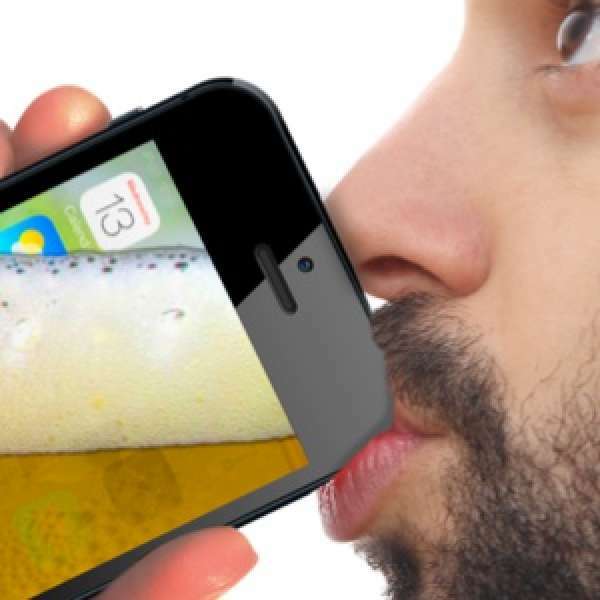 Drink beer on your iPhone. 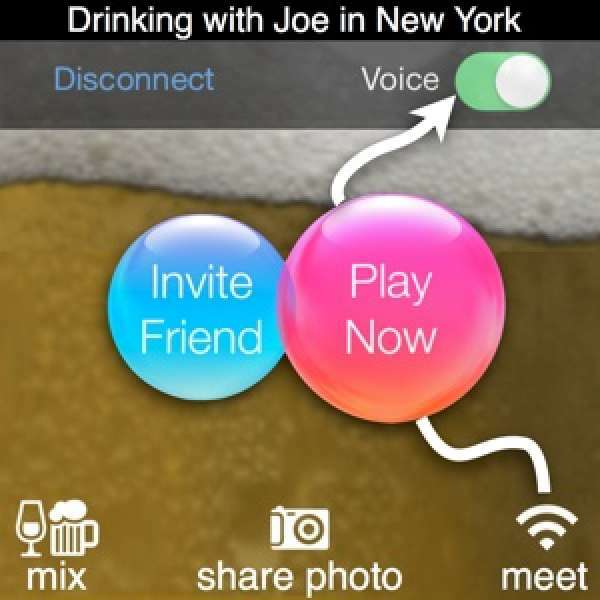 This hilarious visual trick behaves like a real glass of beer and lets you connect with friends or strangers for drink sharing, live voice chat and photo swapping! Our new app looks like a normal note app but actually transmits every word to another smartphone where it appears in large scrolling letters. Brilliant for spies, magicians, or speakers that need unscripted live information hidden from others and the press. Drink with friends and family around the world. Cross-pour drinks (mixing crazy cocktails) with up to 4 people near and far. Share photos behind your drink and voice chat about them live. Drinking alone is a thing of the past! When you tilt your iPhone the beer empties and appears in your friend's iPhone. Pick different drinks and watch the colors mix like in real life! Tap the WIFI button at the bottom to connect. Earn rewards and become the world's iBeer leader! We NEVER charge you twice for in-app-purchases like milk, soda, etc. In iBeer 7.3 just tap "Restore Purchases" if after an update those things are missing. 5 ways to brew iBeer. See Settings Menu for more. Tons of beers and tricks included. Tilt your device to "pour out" beer. Most people "drink" a gulp, then shake to demo the cool foam and drips, then down the rest. Shake beer to make more foam. Run your finger over the glass or beer to make mesmerizing condensation drips. iBeer comes with 4 beers, a mouthwash, and steaming hot coffee. To instantly switch to another drink tap the glass icon at bottom left. To download those you need to be connected to the Internet or else nothing happens. Makes sense, really. We will NEVER charge you again for it even if those things seem missing after updating your device. Just tap "Restore Purchases" or pretend to buy them again and iTunes will tell you that the re-download is free. Drink selector. Quickly switches the kind of drink you want. 6 kinds included. Try the steaming coffee! Background selector. Quickly switches the photo behind your drink. Try a screenshot of your home screen for fun! Live drink sharing. Connect with up to 4 friends via Game Center and cross-pour drinks. Watch the colors change as you mix different refreshments! Settings menu. Dig deep and change all the settings! Who would have though the world demanded to customize an iBeer. You asked. We bowed. Get to the menu by tapping "SETTINGS" at the bottom of your drink selector. Shows which of the many options you selected. See your settings at one quick glance! Beeps, hydraulic sounds and such. The hissing sound of freshly poured beer. Turn it off if you like flat beer. Burp. On or off depending on who you're entertaining and if you want to stay friends with them. Get hilarious celebrity voices right here (requires Internet connection to download). 5 Ways to present iBeer in different context. iBeer classic red button. Note that the WHOLE screen acts as a button on RELEASE. This way you can secretly trigger it with your thumb and pretend that iBeer is voice activated or a fingerprint scanner or a breathalyzer or credit card terminal. Yeah. Some people just push the button. Suit yourself. Machine:Cool vending machine which pours 4 different kinds of beers or mouthwash. Switch to Sodas and Milks via the Strawberry at bottom left. Puts the live view of your camera behind the beer and makes it look like your iPhone is transparent. Drown the world in beer. Hours of fun. Use any photo from your library. Uncle Joe, your kitten, the congressman, or a screenshot of your iPod touch lock screen. Whenever you touch your beer or start screen you'll see the Quick Menu at the bottom. This is to help new users find their way around. As a pro you can just memorize where each of the 4 buttons is and make them invisible here. 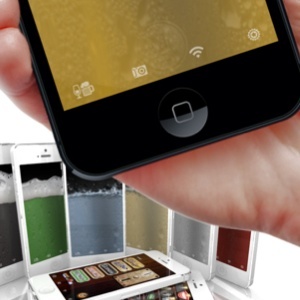 Pretends your iPhone's screen is dirty from the beer. Switch it off if you like things clean. An iBeer classic function. If you still see this in your iBeer you're running an outdated version. Go update. It's free. When you're done drinking an iBeer the app quits and goes back to your real home screen. Some people swear it's funnier than refilling iBeer especially if they start out with the fake home screen (using a screenshot as a background picture). Up to you, your audience, and your thirst. Our award-winning instruction videos. Short, funny, and full of great tips and tricks. Other HOTTRIX apps and real products you'll like. We know you will. We've been inventing stuff for 20 years so there's TONS of wackiness to discover. Visit us now! Sends an email with pre-made text (you can change) to anybody via your email program. We're not collecting your address because we like you. Your shortcut to rate iBeer and post comments. Be kind or we'll have to beg to get our old job back. Not pretty. Drink with friends and family near and far. When you tilt your iPhone the beer empties and appears in your friend's iPhone. It's really like pouring beer from glass to glass. The kicker? Pick different drinks and watch the colors mix! Pour Coffee into someone's milk and watch it steam up. Tap the WIFI button at the bottom of your drink and connect via Game Center. Earn rewards and become the world's iBeer leader! Comment on each other's pictures using Live Audio Chat. Use the new Vodka drink if you want to see photos with more clarity. When you disconnect your original background image returns. It's Apple's secure multiplayer platform that allows you to connect to people you know. Chances are, you're already logged in because it uses your normal Apple ID with which you get games or movies on iTunes and the app store. If you're not logged in yet or have never used Gamecenter before iBeer will open Apple's official login screen for Gamecenter to get you started instantly. This neat AOL video explains step by step how Gamecenter works and how you set it up. Make apps in 60 seconds with InstantApp, our latest invention. Contact us directly for questions and help because your comments on the app store won't reach us for free improvements and updates.